Now Available: Vampire Revised and Hunter: The Reckoning shirts! Got a bunch of new shirts added to our RedBubble store today. 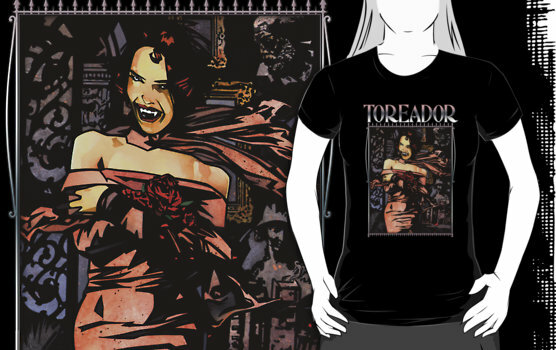 First a selection of shirt designs by artist John Van Fleet added to our Vampire: The Masquerade section. Like our 1e/2e Retro designs, these are based off the look of the Vampire Revised shirts released by White Wolf throughout 1999/2000. Each features one of the Revised signature characters, which may be familiar as the protagonists of the Clan Novel series. 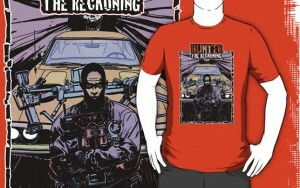 Next is a set of creed illustrations by Tommy Lee Edwards added to our new Hunter: The Reckoning section. Originally shown within the Hunter core, these images were later used on the covers of the “Hunter Book” creed sourcebooks. It’s sad. That shirt died tragically, but heroically, on the way to Red Bubble. Mike found the Martyr files. shirt’s up now. This needs to stop. I’m going to go broke. Already purchased the first two Hunter shirts with the Glenn Fabry art. Now…the Wayward is looking at me. Awesomes. More things to throw my wallet at. Any chance of being able to add custom writing at some point? My V:tM players would love clan t-shirts with their character names/in game quotes written say on the back. That’s not feasible with our current setup, sorry. Vampire Revised signature characters and their signature illustrations from clanbook covers, to me, have been the most iconic in the entire WoD line (both old and new incarnations). I’ll have to get me a Ramona shirt at some point. Or Victoria Ash. Or Lucita. Or Anatole. Or… well. I may have a problem. In general, I am firmly vested in nWoD. I think it is just simply better in every possible way, especially with second edition now out. But if there’s one RPG-related thing that’ll stay with me when I’m 80, it’ll be the VtM Revised cast of signature characters. These shirts are a nice reminder of that fact.